You will be given a reference e-book to read which has 288 pages And the test will be based on that e-book , you can take final test within 1 year of purchase. Who is Software Project Estimator? A software project estimator is one of the most essential positions within a team who aims to successfully run a software project. If you are leading a team who wishes to achieve success when running a software project, then it is advisable for you to carefully select the person who will act as your software project estimator since his roles can greatly impact a lot of essential aspects not only in your project but your entire business organization. The whole software project estimation process can greatly affect all aspects that belong to budgeting and planning including schedule, requirements prioritization and resource allocation and all major elements of project management including personnel and tasks. The estimation of the project’s cost should also be conducted all throughout the life cycle of the software since this will guarantee proper refinement. A software project estimator is also essential when running a software project because this professional is useful in effectively monitoring and controlling the costs of software as a means of verifying and improving costs associated to estimates. It should also be noted that the successful implementation of the cost estimate method used is not all about getting the most accurate initial estimates. It is all about getting the closest rate of convergence between the actual cost and the initial estimate. A proper estimation of everything which goes into the project is a huge help in increasing its chances of success. Working as an effective certified software project estimator at present is already easier with the presence of the related online certification course called software project estimator certification program which is now introduced by Brainmeasures to the public. 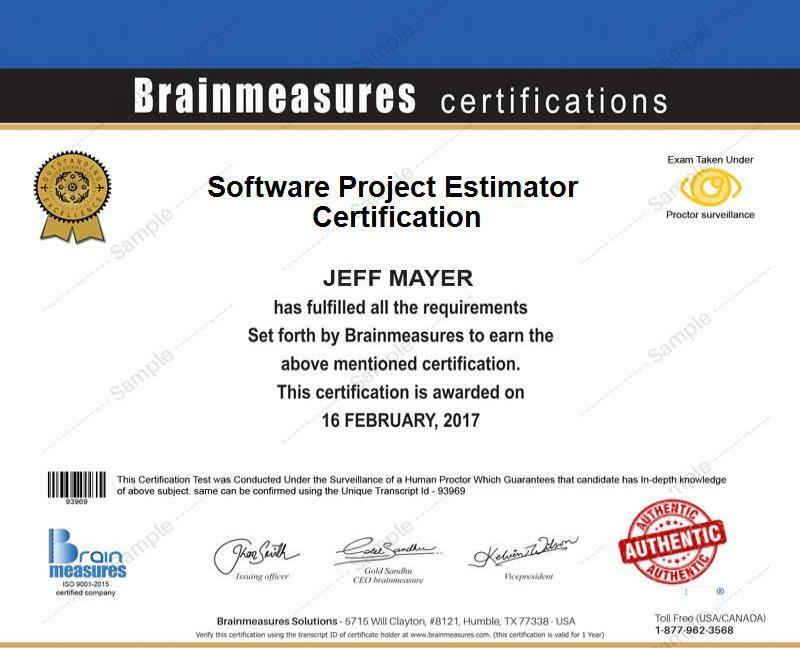 What makes this software project estimator course from Brainmeasures amazing is that it is flexible enough to meet the needs of all individuals and professionals who wish to generate a clearer understanding about software project estimation. This software project estimator certification course allows you to understand every aspect which is related to software project estimation including the scope of work, duties and responsibilities of a certified software project estimator, the benefits of effective software project estimation, major reasons why you need to make the estimates, major aspects in the project and the whole organization that can be greatly affected by effective software project estimation and the most effective methods that you can use to generate the best estimates. Your successful completion of this certification course from Brainmeasures will reward you with a software project estimator certificate which is effective in proving your skills, knowledge and expertise in software project estimation. The software project estimator certification program caters to the needs of all individuals and professionals who want to get to know more about how to perform the software project estimation process. It can work suitably for all managers, software developers and programmers, supervisors, team leaders and all professionals who hold responsibility in running software projects and making sure that these become successful. Your software project estimator certification also serves as your ticket towards earning higher. You can actually use your software project estimator certification to become more effective when working as a software project estimation manager and this profession lets you receive around $46,000 to $80,000 annually. You can also work as a certified software project estimator which supplies an annual salary of around $63,000 to $121,000.